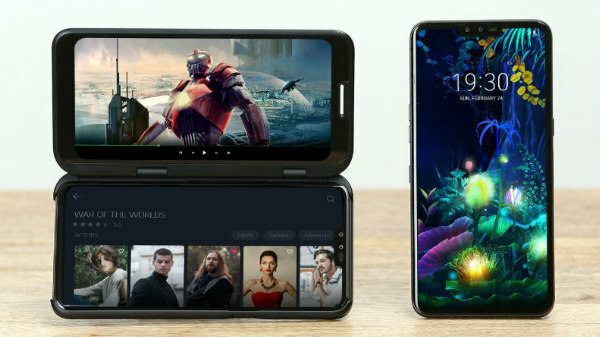 LG announced the LG V50 ThinQ at MWC 2019, along with the LG G8 ThinQ. Now, the company has officially announced that the LG V50 ThinQ will be available from the 19th of April, starting from South Korea. The LG V50 ThinQ will be available in South Korea from the 16th of April 2019. The standard variant retails for 1,199,000 won or $1055 or Rs 73,100. The dual screen accessory comes with a price tag of 2,19,000 won or $195 or Rs 13,350. As of now, there is no information on the launch of the LG V50 ThinQ in India. The LG V50 ThinQ has a 6.4-inch 2K OLED display with 2.5D curved tempered glass. The Qualcomm Snapdragon 855 SoC powers the smartphone with 6 GB of RAM and 128 GB of internal storage along with a microSD card slot for additional storage space. The LG V50 ThinQ is also one of the first smartphones in the world to launch with the Snapdragon X50 5G modem, with support for true 5G networking capability. Coming to the camera, the smartphone has a 12 MP primary sensor with an f/1.5 aperture, a 16 MP super wide angle lens with an f/1.9 aperture, and a 12 MP telephoto lens to offer portrait mode and 2x optical zooming capability. On the front, the device has a dual camera setup with an 8 MP primary camera and a 5 MP secondary camera with an f/2.2 aperture. Like most of the LG flagship smartphones, the LG V50 ThiQ is IP68 certified for water, and dust resistance with MIL-STD 810G certified for added durability. The LG V50 ThinQ is one of the few flagship smartphones of 2019, to retain the 3.5mm headphone jack with a USB type-C port for charging and data syncing. The device has a massive 4000 mAh battery with support for Qualcomm Quick Charge 3.0.